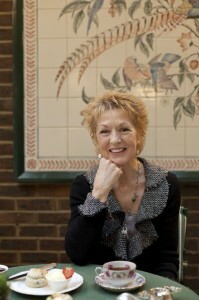 It was with much anticipation and delight that I interviewed Jane Pettigrew, tea aficionado. Jane is a well established tea specialist and historian whose accolades include authoring many books, teaching on the subject (including her famous tea masters classes she teaches with Tim Clifton) and acting as a consultant around the world. The interview was so terrific, we have divided it in 2 parts. (Thank you Jane for your time!). Enjoy part 1. When did you first develop your interest in tea? Well I suppose my interest developed with me when I was growing up because I grew up in Britain in the 50s and everybody drank tea, it was part of our life. We had tea parties at the weekend, with my Granny, round the fire in winter, in the garden in summer, so it was part of who I was. But my real interest started in the 1980s. I gave up a career in education – I was a language teacher and communications trainer – and I’d been doing that for about 12 ½ years. I didn’t really like the direction it was going and was on the verge of re-training to do something completely different. I didn’t know what. Then I was with 2 friends one weekend and they happened to say there is a building for sale, cheap in London, where they lived and which I knew very well. We decided there and then to buy it! Then we had to decide what we were going to do with it and we decided we would open a tea room. We had always loved having tea parties, because it was very much a part of our lives: We were about the same age and because we liked baking cakes and loved buying our art deco and 1950s tea things – cake stands, jam dishes, muffin dishes, cups and sauces. You know, all the things you collect to have a tea party. And we just loved the whole thing and thought “Oh wouldn’t it be fun to have a tea room”. And so, knowing nothing at all about tea, and nothing at all about running a business, we opened a tea room. That was 1983. Then I started being asked to give talks to groups such as American women’s ex-pat clubs around London, South East of England, about why we drink tea as much as we do, where Assam came from, the history, everything to do with tea. And I didn’t know anything about that so I thought I better start researching and, of course, when you start getting into tea it becomes very very fascinating and it has many different strands. So whichever route you go down you’ll find a lot of surprising things that you never knew existed. It sounds like at the time it may have seemed you accidentally got into it but in hindsight it sounds more like it was fate? Yes, tea found me, I didn’t find tea. Exactly. I have to ask you though, do you drink coffee? Hardly ever. If I do drink coffee, I drink a latte with very little coffee and lots of milk. And it’s usually because it’s cold, or it’s very early in the morning so my tummy needs something in it, something milky to work on first thing in the morning whether because it’s cold or because I am hungry. But no, I don’t really like the taste. You’re a true tea drinker? Yes. You know it’s funny because obviously most people have space in their life for both, but I would say that people who really get into tea gradually drink less coffee…some people love that first cup [of coffee] in the morning but then they’ll drink tea through the rest of the day. I just think they are such different beverages that do meet different needs. Coffee is different to digest whereas tea for me is very gentle, cleansing and uplifting. Tea has all these magical things in it, amino acids and theanine…it does so much good to just keep you de-stressed and very focused. What is your favourite tea or what are your favourite teas? I don’t have a favourite, because different teas suit different times of the day, different temperatures, different climate, different moods, different foods. I probably have different favourites for different times of the day. I usually start with something strong, whether an English Breakfast blend, or a straight Assam Orthodox, or a Keemun. Those are my favourites in the morning. If I can’t have them then I feel like something is missing from my start to the day. As the day goes on I want something at my elbow, something at my side that I’m just sipping at all the time. It would be an Oolong tea because I can just keep adding water to the same leaves – a lovely lovely gentle flavor. Or I might have a Green tea on the go. If I am having afternoon tea with food, I would almost certainly drink something like a Ceylon tea because a good high grown Ceylon goes brilliantly with most afternoon tea foods, whether it’s sweet or savoury. Or I’d have an Assam tea. In the evening, if I’ve got guests for dinner we will always finish with a bowl of Jasmine tea or Oolong tea, or some white tea. Something elegant, refined and exotic. What countries do you think grow really great tea? There are many now. Tea is grown in about 56 countries and the traditional origins like India, Sri Lanka, China, Japan, Taiwan and Korea are all producing fantastic teas. But, it’s important to remember tea is a crop and like all crops it is very affected, for good or for ill, by weather and climate. Some years have recently been very very difficult so sometimes what you expect to be a great tea from a traditional origin turns out to be quite disappointing. Not through anybody’s fault necessarily but because the weather has played tricks on everybody and of course because of the manufacturing processes, how well they are carried out. So, you can never assume that even the most recognised traditional origins will produce a good tea because it all depends on so many different factors. What you have to do is always taste. No tea is ever bought [by a tea buyer/broker] without it being tasted and you can look at a leaf and think “that looks fantastic”. When you look at it and the name and you think “that sounds fantastic”. But until you actually taste you really can’t tell. I don’t think people really understand how varied the teas can be, even from just one origin, week to week, year to year. So, yes, China, Japan, Taiwan, India, Sri-Lanka, [are] obviously highly recognised and certain parts of Africa. I’m just working with a Kenyan company at the moment – Royal Tea of Kenya – who are getting very unusual specialty tea out of Kenyan plantations and factories into the market now. Usually they produce tea bag teas which you know, get blended for English breakfast type mixes but they’re now beginning to produce some really excellent Orthodox Blacks, some Whites. You know, other parts of Africa are doing the same, and these unusual trends are beginning to be apparent everywhere. So, you’ve got unusual teas produced in origins that you thought only produced certain, let’s say, teabag Blacks or whatever, and they’re beginning to explore other possibilities. So there’s that change in the market now. There’s also new tea growing areas. For example, in New Zealand a Taiwanese family is growing the most amazing Oolong [tea]…which are really up to any standard you’d expect from Taiwan: It’s Taiwanese technology, Taiwanese types of teas, Taiwanese cultivars that have been planted on the North Island so there’s no reason on Earth why they shouldn’t be so wonderful. You’ve also got Hawaii for example, being where they’re growing amazing variety of hand-crafted teas by people who do other jobs (carpenter, farmer, dancer, potter) but tea is their hobby and they’re producing teas because they love the whole subject: They love growing it, they love manipulating the leaf so you’re getting some handcrafted tea coming out of very unusual origins. So the whole thing is a little bit less predictable then it used to be. It used to be, obviously, Japan makes and drinks Green Tea, China drinks Green Tea, England drinks Black Tea. So when you come to talk about who is producing great teas, it’s actually very hard to say because you have to keep an open mind. It’s great for tea drinkers though. It’s amazing for tea drinkers! And I think the fact that the specialty tea market is growing is why some unusual origins are now trying different things, planting different cultivars trying different types of tea with the cultivars they have. You never know quite what’s going to happen until you try it. So, you know, people are prepared to put the time and the money in and they’re producing some wonderful things they don’t necessarily expect to. It just makes it fascinating for the tea drinker.